I do, honestly, intend to avoid posting cat pictures. Tonight, the best I can say is that it isn't a panther picture. It is a beautiful lioness statue that our friends brought back from a trip to Africa last year. 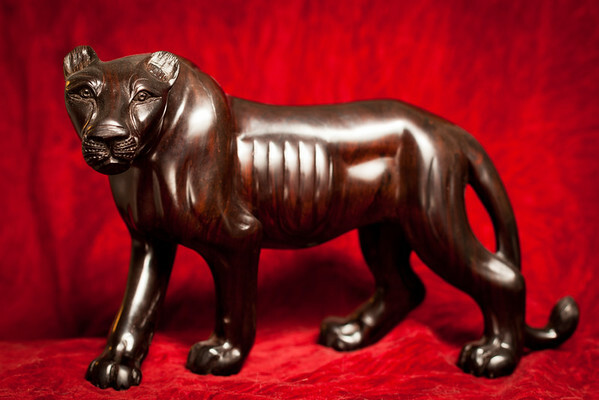 This statue is very dark wood - and so, tends to be referred to as a panther here at home, though it isn't. CKB suggested this as a subject, pondering how it would be possible to get a picture of something this dark. The trick, of course, is that the statue is fairly reflective and has good contours, perfect for creating specular highlights and giving texture to what would otherwise be an inky sponge for light. I just needed to provide enough light coming from a couple different directions at once. This took some experimenting. My set was the dining room table. For a backdrop, I used a red crushed velvet curtain - I think was intended for CKB's apartment, before we got married, but got shelved for years until I dug it out for photo purposes. I threw that over the back of a couple chairs and spread it out over the table. I used two cork trivets underneath as a stage for the statue. As far as lights go, I currently only have a single flash - the 430ex. This I mounted this on a light stand behind a white shoot-through umbrella. It was triggered remotely with an ST-E2. I started with the light stand to the left of the camera, generally above the statue. Shot a few frames like this, adjusting aperture and shutter speed until I had almost the look I wanted. This frame ended up at ISO 100, 1/60th @ f/4.5. The flash was the "key" light, and was aided by a chandelier from directly above, plus a CF off to camera left. If you look close, you can see reflections from each source. From there it was mostly a matter of framing by moving myself around and adjusting the angle of the lights. Going with the "available light means using any light source (or modifier) you have available," I added a small bit of fill with a reflector almost flat in front of the statue and another off to one side. For these I used a couple of 14" pizza pans I had on hand in the kitchen. The light stand eventually got moved around to the right and the umbrella was positioned fairly close to the statue. The frame was cleaned up a small bit in Lightroom. Cropped and straightened, then adjusted the contrast and fill light. White balance remains "as shot." Enabled lens profile corrections and then added just a touch of post crop vignette. Titled it, added it to the target collection and published to SmugMug.